Think of Transforming Organizations as a user’s guide for organizational change — an explanation of and blueprint for a transformative, systems-based approach to strengthen progressive organizations. It goes beyond the introduction presented in What is Transformation? to deconstruct successful organizational change efforts and provide step-by-step guidance for leaders and consultants. This wealth of practical and directly applicable information is made real in nine case studies from organizations including MoveOn.org, Rainforest Action Network, the National Council of La Raza, and the National Domestic Workers Alliance. Inspirational leaders interviewed throughout the paper are candid about their failures as well as their victories. Their experiences bring to life the ideas and theories behind their efforts. 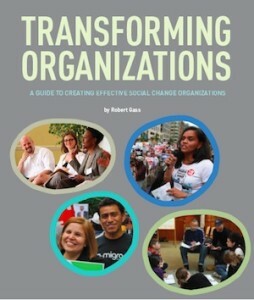 The paper also includes a nuanced analysis of the Wheel of Change and how to put it to use; guidance on common challenges such as building trust and diversity, board development, and hiring consultants; and a thorough exploration of what effective, healthy, transforming social change organizations look like. You can download the PDF below or email us to order a physical copy.